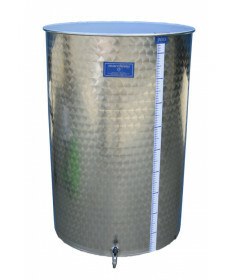 Variable capacity wine tanks are made of stainless steel and can be used for primary fermentation, secondary fermentation and even as a bulk wine dispensing vessel. 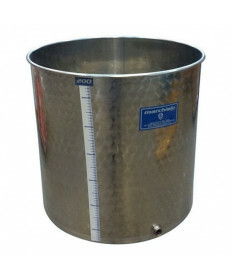 The beauty of a variable capacity wine tank is that regardless of the volume of wine that is in the tank, the wine spoiling air can be eliminated as the lid floats on the surface of the wine. This ensures that the wine will not be exposed to the oxidizing effects of air. The Grape and Granary regularly stocks 100 liter (26 US gallon), 200 liter (52 US gallons) and 300 liter (78 US gallon) stainless wine tanks. These tanks are made in Italy by the Marchisio manufacturing company in Pieve di Teco, Liguria. Each tank ships complete with Complete with floating lid, airlock, rope, inflatable gasket, pump with hose and spigot. 100 liter tanks can be shipped via Fedex or UPS. 200 and 300 liter tanks must be shipped via common carrier (semi-truck). Contact Us if you have questions about any of our variable capacity wine tanks.